D’Uccle chickens are quite unique looking chickens, with a certain charming aura. This breed comes in several varieties and one of them is called Mille Fleur, which sometimes, incorrectly, gives the name for the entire breed, although other breed are to be identified in the color pattern of the Mille Fleur. 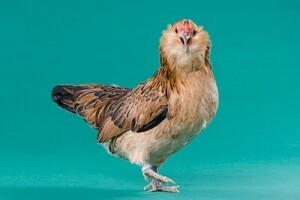 The birth of this breed is identified sometimes in the late nineteenth century, in Belgium, when the Booted Bantams and the D’Anvers breeds were mixed. The varieties available at the beginning were the Porcelain, Mille Fleur and the White. In the early twentieth century, the American Poultry Association allowed the registering of the Bearded Belgian D’Anvers as a breed accepted for shows. After this Mille Fleur variety, a few others were also included in the registries, but Mille Fleur is certainly the most attractive of all. The plumage is multicolored, including reddish brown with white marks all over and only black on the tail. The D’Uccle chickens have a formation of feathers on the face which resembles to a beard, which makes them rather funny, but pretty. Bearing one normal comb and either no or particular small wattles, the D’Uccles have a pretty large chest and a small back, which leads to a V-like formation between the tail and the head. The weight of an adult male doesn’t usually go past 750 grams, while the female’s is usually limited at around 650 grams. They excel in foraging, doing very well on their own if the space they have available is big enough. The care level for the D’Uccle chickens is a relatively low one. These birds do well in areas that are exposed to lower temperatures, given the fact that they have a normal comb and tiny wattles, along with a face protecting ‘beard’ made of feathers. Maybe the most important aspects in taking care of these chickens are related to their roosts, which need to be kept dry and clean. This is essential if wanting to breed the D’Uccles for shows as well, as their long feathers present on their feet can get very dirty otherwise. Good, clean and dry conditions need to be provided not only to their bedding, but also to the yard they have access to, as running through mud and feces can add up and stick to their toes, which can further complicate things and result even in the loss of the tips of the toes or the nails. It is not a big challenge to breed the D’Uccle chickens, especially that they have an average rate of fertility and pretty strong chicks. While some of the hens can be quite fond of brooding, only some of them will carry out the entire brooding process, until the eggs hatch, as boredom can occur and they will simply abandon the eggs with several days before the hatching takes place. In this instance, an incubator turns out to be very helpful, or the option of getting the eggs brooded by more conscientious hens from other breeds such as Bantam Silkie or Cochin.